1886. Bridge over the Riachuelo. EDWARD WOODS, who was perhaps the oldest railway engineer in this country, died at his residence, 45 Onslow Gardens, London, on the 14th June,1 903, at the age of 89. He was born in London on the 28th April, 1814, and received his early education at private schools. When he was 15 he went to Bristol and began definitely to study for his future profession. His various holidays were spent in visiting the great engineering works which were then in progress. In 1834 George Stephenson relinquished the charge of the Liverpool and Manchester Railway in order to undertake the Construction of the Grand Junction Railway from Warrington to Birmingham. The vacancy thus created was filled by the promotion of John Dixon from the post of Resident to that of Chief Engineer. At the same time Edward Woods was appointed one of Mr. Dixon’s assistants, and took charge of the section from Liverpool to Newton-le-Willows, a length of 15 miles, including the tunnel between Lime Street and Edge Hill, which was then in course of construction. The duties assigned to this young engineer were to superintend the works, to look after the contractors for the permanent way, set out new works, pay the contractors, police, etc., along the line, and attend the fortnightly meetings of the Board of Directors. In 1836 Mr. Woods succeeded Mr. John Dixon as Chief Engineer of the Liverpool and Manchester Railway, with the additional charge of the mechanical department. It was thus his good fortune to have the opportunity of observing the gradual and progressive development of the railway system from its very early days. One of the first practical experiences he there gained was the importance of laying the rails on an elastic road-bed. In the first instance the line had been laid, during its construction in 1829, with wrought iron 'fish-belly' rails, costing £11 to £12 a ton, carried in chairs which were fixed in stone blocks in all the cuttings, whether in clay or in rock. Sleepers were only used on the embankments, in order to facilitate the repairs of the road and the raising of the line when the embankments settled. How firmly the mistaken belief in a rigid roadway was at first entertained may be gathered from the fact, recorded by Mr. Woods, that, in making the Manchester and Bolton Railway, Jesse Hartley, then the Engineer to the Liverpool Dock Estate, who had great faith in solid masonry, and to whom the engineering of the line had been entrusted, even went so far as to build solid stone walls for laying the rails on ; the whole road had afterwards to be taken up and relaid with sleepers. The removal of the stone blocks from the cuttings on the Liverpool and Manchester line was a less serious undertaking, and some of these curious reminders of the earliest lessons learnt in the construction of permanent way are still to be seen piled alongside certain portions of the railway. The original tunnel, of 2,025 yards length, rising from Lime Street Station, in Liverpool, up a gradient of 1 in 97 to Edge Hill Station, was worked from the outset until March, 1870, with ropes driven by winding engines at the top of the incline. But Edge Hill being in 1830 a residential suburb, the boilers and chimney were required to be placed about a quarter of a mile distant from the engine, to which the steam was conveyed through a cast-iron main of 10-inch bore, along a culvert driven through the red sandstone rock. Here during July, 1836, Mr. Woods made observations which showed that the condensation in the long steam main caused the loss of half the fuel burnt. Besides the tunnel, there were two other inclines on the Liverpool and Manchester Railway, each 1 in 90, which George Stephenson originally contemplated working by fixed engines and ropes ; but that intention was abandoned after it had been found that locomotive adhesion was itself sufficient. In subsequently laying out the Lancaster and Carlisle Railway, Joseph Locke did not shrink from a locomotive gradient of 1 in 70 for the Shap Fell incline of 7 miles length. Robert Stephenson, however, limited himself to 1 in 330 for the ruling gradient of the London and Birmingham Railway. The cost of working the three rope inclines from Edge Hill-one for the passenger traffic to and from Lime Street, and two for the goods trains to and from the Docks-was stated by Mr. Woods to have averaged 8d. per train-mile in 1852. Resistance to railway trains was an early subject of his experimental investigation. To determine the mean value of 'railway constants,' the British Association appointed in 1837 a committee, of which Mr. Woods was a member, together with Mr. Rennie, Sir John Macneill, Mr. Locke, Dr. Dionysius Lardner and Hardman Earle. Their first experiments, reported by Dr. Lardner to the Newcastle meeting in August, 1838, were made in the same year by observing the known action of gravity upon trains of given weight descending given gradients ; the resistance could then be correctly deduced when a uniform velocity had been attained. Analysis of the engine power was less satisfactory; in Mr. Woods’ opinion, the information as to the action of the steam in the cylinders not being sufficiently accurate. Moreover, with regard to the air resistance, not only had the frontage resistance to be considered, but also the friction of the body of air carried along with the train. In July and August, 1839, a second series of experiments were made. These were reported to the British Association Meeting at Plymouth in 1841, by Dr. Lardner and also by Mr. Woods, who had been largely instrumental in personally carrying out both series of trials. On the 30th January, 1838, Mr. Woods read a Paper before this Institution on the locomotive engines on the Liverpool and Manchester Railway. This Paper gave, according to the Report of the Council for 1840, some of the earliest and most accurate details on the actual working of locomotive engines, and seems to have been his first recorded connection with the Institution. In 1844 he laid before the Liverpool Polytechnic Society a review of the circumstances which had affected the consumption of fuel in the locomotives of the Liverpool and Manchester Railway from the opening of the line to the end of 1843. Again in 1850, while still in Liverpool, he published a pamphlet giving his observations on the consumption of fuel and the evaporation of water in locomotive and other steam-engines, and mentioned his personal knowledge of many facts connected with the history and development of the locomotive engine on the first field of its application to the transport of passengers and merchandise at high velocities-namely, the Liverpool and Manchester Railway. In 1848 he found the duty of 1 lb. of coke in the locomotives on this railway was 316,000 foot-pounds, equivalent to 6.25 lbs. of coke per horse-power per hour. On the 'Swiftsure' locomotive he also made a trial at that early date of burning anthracite; but he found that, as soon as put on the fire, much of it became converted into a fine powder, which choked the fire-bars and tubes, and was carried up the chimney and fell unconsumed on the carriages of the train ; steam could not be generated with it at the same rate as with coke. Mr. Woods’ relations with the Liverpool and Manchester Railway extended from the 1st January, 1834, to the end of the year 1852, a period of over eighteen years; for, although the Liverpool and Manchester Railway became incorporated with the Grand Junction Railway in 1845, he remained in the service of the amalgamated companies to design and carry out the various works specially identified with the interests of the Liverpool and Manchester Railway Company, for which Acts of Parliament had been obtained. The principal of these was the Victoria Tunnel of over 2 miles in length, passing under the City of Liverpool and connecting the Edge Hill Station with the Docks at the North End. Serious difficulties were experienced in the construction of this tunnel, of a similar nature to those afterwards encountered on a larger scale by the Metropolitan Underground lines tunnelling under buildings in London : it was completed in June, 1848, and included a commodious goods-station at its terminus adjoining the Waterloo Dock. Another work was the railway connecting the main line at Patricroft with the Liverpool and Bury Railway at Clifton, which was opened in January, 1850. Mr. Woods had previously designed and carried out the construction of the line through Salford and part of Manchester, which forms the connecting link between the Liverpool and Manchester and the Leeds and Manchester Railways. This line was completed in the year 1844. In 1853 Mr. Woods left Liverpool, and settled in London as a Consulting Engineer on his own account. Before long he succeeded in establishing an extensive practice, and, in addition to works at home and elsewhere, his name may be specially connected with the development of the railway system in South America. The subject of the choice of the best fuel for locomotives occupied much of his attention. Trials had been made in 1852 of burning coal in locomotives, instead of coke, which till then had been universally employed. In 1853, in conjunction with W. P. Marshall, he presented three joint reports to the General Locomotive Committee of the London and North Western Railway, giving the results of experiments carried out between London and Rugby on the passenger and goods engines employed on the southern and northern divisions of the line. The conclusion arrived at was that engines of 18 tons, with 700 square feet of heating surface, worked the trains as satisfactorily as those of 30 tons and 1,300 square feet of heating surface, with a close coincidence in the water and coke consumption when running with equal loads at equal speeds; and it was recommended that the passenger engines, weighing 23 tons in working order, should have cylinders 16 inches in diameter by 20 inches stroke, and driving-wheels 6.5 feet in diameter; that the goods engines, weighing 25 tons in working order, and to draw a train of 264 tons, should have cylinders 16 inches in diameter by 24 inches stroke, and driving-wheels 5 feet in diameter; in both classes the weight on drivers not to exceed 10 tons; grate area, 13 square feet; heating surface in fire-box, 80 square feet; and in tubes, 900 square feet. The causes of the expenses on the southern division being heavier than on the northern were summarised. In 1854 a further joint report was presented on the use of coal in the locomotives of the southern division ; and on the whole the conclusion seems to have been unfavourable to coal, for the larger portion of the then existing stock of engines. While 1 lb. of coke evaporated 8.65 lbs. of water, 1 lb. of coal evaporated only 5.83 lbs. In 1853, as subsequently stated by Mr. Woods, the duty of 1 lb. of coke in the London and North Western engines was 355,000 foot-pounds, equivalent to 5.75 lbs. per horse-power per hour, being a saving of 0.5 lb. on the consumption of 6.25 lb., which he had found in 1848 on the Liverpool and Manchester Railway. In his experience there was no fixed ratio between the evaporative power of fire-box surface and tube surface in locomotive boilers ; and whatever the ratio might happen to be it had nothing to do with economy of fuel. Though the battle of the gauges in 1838, provoked by Mr. Brunel’s adoption of 7 feet for the Great Western Railway, showed that the majority of the combatants sided with the present standard 4 feet 8.5 inches gauge, Mr. Woods, however, seems to have held the opinion, now largely shared, that the Irish gauge of 5 feet 3 inches, or the Indian gauge of 5 feet 6 inches, would have been preferable to either of the two then engrossing almost exclusive attention. His subsequent experience comprised six railway gauges - 5 feet 6 inches, 4 feet 8.5 inches, 3 feet 9 inches, 3 feet 6 inches, 3 feet, and 2 feet 6 inches - besides tramways of still smaller gauge. In the colony of Victoria, where the 5 feet 3 inches gauge had been adopted and carried out for 453 miles, it was contemplated in 1872 to introduce a 3 feet 6 inches gauge for 600 miles of new lines projected. Mr. Woods, Sir Henry Tyler and T. E. Harrison, Past-President, independently of one another, were requested by Mr. Childers, then Agent-General for Victoria, to report on the proposal. All three agreed in recommending that the existing 5 feet 3 inches gauge should be adhered to for the new lines, rather than that second and narrower gauge should be introduced ; and the Colonial Government decided to follow their advice. The difference in cost Mr. Woods calculated would not have been more than £360 per mile in favour of the narrower gauge, against which would have had to be set the grievous disadvantages of a break of gauge. On the same grounds he was of opinion that in India it would have been preferable if branch lines had been made on the same 5 feet 6 inches gauge as the main lines, regarding it as a fallacy to consider that the cost of a railway is proportional to the width of gauge. Generally, indeed, it may be said that he looked upon a break of gauge as essentially a retrograde movement. None the less did it appear to him that a mistake had been originally made by the Indian Government in sanctioning lines equal and even superior to first-class English railways. In the United States, and in the republics of South America, he found that standard gauge railways were constructed at less than half the cost of the Indian lines. Prior to 1873 he had made the Central Argentine Railway, 247 miles in length, of 5 feet 6 inches gauge for little over £7,000 per mile, including sidings, stations, rolling-stock, and rails of 62 lbs. per yard. Yet earlier, about 1859 he had to construct the Copiapo Extension Railway of 27 miles, from Pabellon to Chanarcillo, in Chili, under instructions that the line was to be worked by mules, instead of by locomotives, owing to the steepness of the gradients. Mule traction proving a failure, he then designed engines light enough for the rails of only 42 lbs. per yard, with six-coupled driving-wheels having 4 tons on each wheel, and a four-wheel bogie carrying 8 tons, making 32 tons total. After the Antofagasta and Salar Railway of 2 feet 6 inches gauge and 78.5 miles length had been laid with light rails for the light traffic anticipated, the traffic became much greater; and being then consulted, he had to advise that the line should be strengthened, though at a large extra expense. Mr. Woods had also many years’ experience of working round curves of even as little as 4 chains radius (264 feet) with engines having a four-wheel leading bogie with transverse motion, and without flanges on the leading driving-wheels. On the lines in South America so worked he had no instance of derailment at the ordinary speeds of 25 to 30 miles an hour. With the Santiago and Valparaiso Railway in Chili he was connected from its projection in 1850, and supervised the construction of materials for permanent way, iron bridges and. working plant. The engines, built from his designs by R. and W. Hawthorn, Newcastle-on-Tyne, had end-long play in the axle of the hind driving-wheels, to facilitate running round curves. For the Coquimbo line in Chili he afterwards sent out a tank engine with a two-wheel bogie truck, which proved highly satisfactory. For the Mollendo- Arequipa and Callao-Oroya Railways, made by the Peruvian Government, he superintended the materials sent out from Europe. Of the Fairlie engine he seems to have had a favourable opinion, owing to its whole weight being utilized for tractive power; he stated that it worked remarkably well on the Mexican Railway. At the Plymouth meeting of the British Association in 1877 Mr. Woods was President of the Mechanical Section, to which he delivered an address on the Subject of 'Adequate Brake Power for Railway Trains. 'Therein he reported the experiments made by himself, in conjunction with Colonel Inglis, R.E., for the Royal Commission which had been appointed in 1874 to inquire into the causes of accidents on railways. The experiments had been made with eight systems of continuous brakes; and from the results observed he drew up a list of thirteen conditions, which he considered indispensable for a continuous brake for heavy fast trains. Apart from railway work, he was also engaged in the construction of buildings in Peru, for which, like some other engineers, he, considered a lighter construction was preferable to one more solid, with a view to withstanding earthquakes better. So long ago as 1851 he built at Pisco, on the coast of Peru, a wrought-iron pier 2,400 feet long, on screw piles, which suffered no injury whatever in the great earthquake that overwhelmed the city of Arica, in the north of Chili, 550 miles south of Pisco. In 1877 he constructed a quay wall at Bilbao without a cofferdam, by simply driving sheet piles in two rows at a distance apart equal to the width of the wall, and then removing the sand between them to the depth of 12 feet or 15 feet by means of a Woodford pump, and filling the trench with concrete. Turning to yet another branch of engineering, Mr. Woods was Consulting Engineer to the Bournemouth Gas and Water Co from its incorporation in 1863 up to the time of his death. In 1869 he became Engineer to the Monte Video Waterworks in Uruguay, projected by local capitalists and subsequently taken over by an English Company. For the Corporation of the City of London he conducted a series of observations with Joseph Quick and Son, in connection with the Water Bill of 1884, of which the principal object was to give householders the option of taking supplies by meter. From this cursory sketch it will be seen that Mr. Woods was an engineer of wide experience and large views, who, during a lifetime co-extensive with the history of the railway world, was always found in the van of progress, and never allowed himself to relax his interest in the work going on in all branches of the profession. How lightly and happily he bore his weight of years was witnessed with wondering admiration by all who were privileged to accompany him in the visit paid on the 24th July, 1902, to the Blagdon Waterworks, in Somersetshire, constructed for augmenting the water-supply of Bristol. In that excursion, to which the Council of the Institution were invited by the President, Charles Hawksley, the Engineer of the undertaking, Mr. Woods tramped about cheerily with the rest of the visitors over all the ground they had to traverse on hot, for inspecting the work completed and in progress. Doubtless both his strength of character, soundness of judgment, and fertility of resource were largely aided by the singularly amiable disposition and quiet manner which distinguished him throughout his long, useful and active career, and made friends of all who enjoyed the privilege of his acquaintance. Mr. Woods married in 1840, Mary, daughter of Mr. Thomas Goodman, of Birmingham, by whom he had three sons and two daughters. Reference has already been made to the Paper contributed to the Institution in 1838. On the 7th April, 1846, he was elected a Member. On the 21st December, 1869, he became a Member of Council, a Vice-President on the 20th December, 1881, and on the 25th May, 1886, he was elected President. His Presidential Address, delivered on the 9th November, 1886, comprised a valuable account of the development of the railway system, not only in Great Britain and her dependencies, but also in foreign countries. He took at all times a warm interest in the welfare of the Institution, and even of late years, in spite of his great age, was a not infrequent attendant at its meetings. 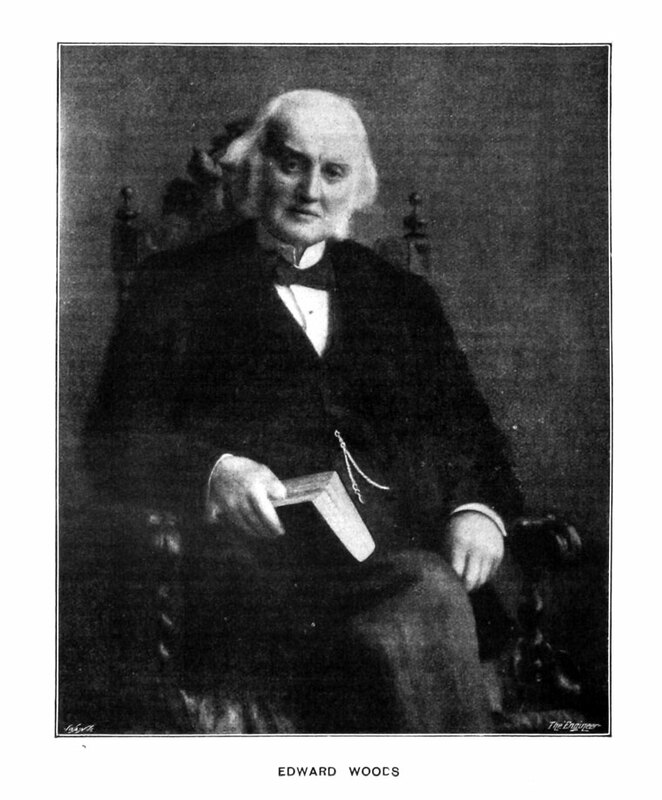 WOODS, EDWARD (1814–1903), civil engineer, born in London on 28 April 1814, was son of Samuel Woods, a merchant. After education at private schools, and some training at Bristol, he became in 1834 an assistant to John Dixon, recently appointed chief engineer of the Liverpool and Manchester railway. Woods was placed in charge of the section, 15 miles in length, between Liverpool and Newton-le-Willows, including the tunnel, then under construction, between Lime Street and Edge Hill stations; and in 1836 he succeeded Dixon as chief engineer, taking also charge of the mechanical department. The Liverpool and Manchester railway was amalgamated with the Grand Junction railway in 1845. Woods remained until the end of 1852 in charge of the works appertaining to the Liverpool and Manchester section, including the construction of the Victoria tunnel (completed 1848) between Edge Hill station and the docks, a large goods station adjoining the Waterloo dock, and a line between Patricroft and Clifton, opened in 1850. In 1853 he established himself in London as a consulting engineer. During his eighteen years' work on the Liverpool and Manchester line Woods took a prominent part in various early experimental investigations into the working of railways. In 1836 he made observations on the waste of fuel due to condensation in the long pipes conveying steam about ¼ mile to the winding-engines used for hauling trains through the Edge Hill tunnel, the gradient of which was then considered too steep for locomotives. He was a member of a committee appointed by the British Association in 1837 to report on the resistance of railway trains, and presented a separate report (British Assoc. Report, 1841, p. 247) apart from two reports made by Dr. Dionysius Lardner [q. v.]. In 1838 he presented to the Institution of Civil Engineers a paper (Transactions, ii. 137), ‘On Certain Forms of Locomotive Engines,’ which contains some of the earliest accurate details of the working of locomotives, and for which he was awarded a Telford medal. The consumption of fuel in locomotives was the subject of a paper presented by him to the Liverpool Polytechnic Society in 1843 (published in 1844), and of a contribution to a new edition of Tredgold's ‘Steam Engine’ in 1850. In 1853 Woods carried out, with W. P. Marshall, some experiments on the locomotives of the London and North Western railway, between London and Rugby, and three joint reports were made to the general locomotive committee of the railway, recommending certain weights and dimensions for various classes of engines. These were followed, in 1854, by a joint report on the use of coal as a substitute for coke, which had been used hitherto. From that date onwards his practice was chiefly connected with the railways of South America, including the Central Argentine railway, the Copiapo extension, Santiago and Valparaiso, and Coquimbo railways in Chile, and the Mollenda-Arequipa and Callao-Oroya lines in Peru. He was responsible not only for surveys and construction, but also for the design of rolling stock to meet the somewhat special conditions. 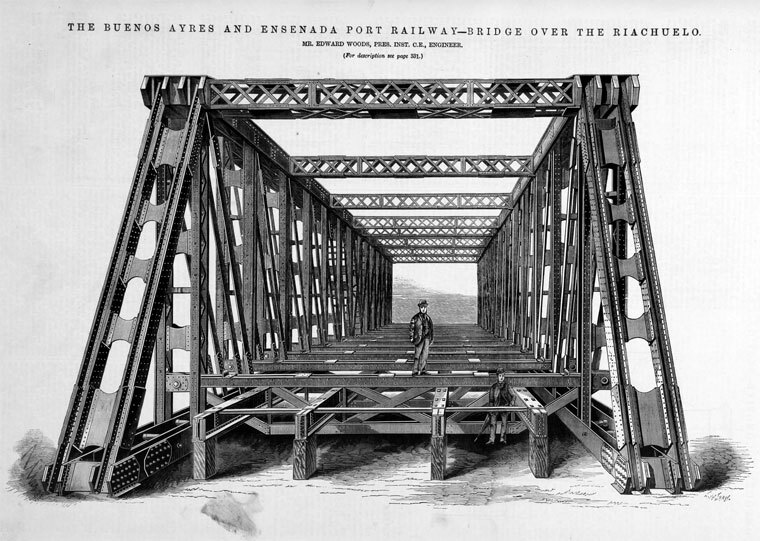 Other engineering work included a wrought-iron pier, 2400 feet long, built in 1851 on screw piles at Pisco on the coast of Peru, and a quay-wall built at Bilbao in 1877. In the ‘battle of the gauges’ he favoured the Irish gauge (5 feet 3 inches) or the Indian gauge (5 feet 6 inches). He regarded break of gauge as a mistake. In 1877, as president of the mechanical science section of the British Association, he delivered an address on ‘Adequate Brake Power for Railway Trains.’ Elected a member of the Institution of Civil Engineers on 7 April 1846, he became a member of its council in December 1869, and was president in 1886–7. His presidential address (Proc. Inst. Civ. Eng. lxxxvii. 1) contains much information as to the early history of railways. In 1884 he was president of the Smeatonian Society of Civil Engineers. He died at his residence, 45 Onslow Gardens, London, on 14 June 1903, and was buried at Chenies, Buckinghamshire. His portrait in oils, by Miss Porter, is in the possession of the Institution of Civil Engineers. He married in 1840 Mary, daughter of Thomas Goodman of Birmingham, by whom he had three sons and two daughters.